A taut tale of greed, murder, and revenge as combat-weary Marines take on the crooks of Wall Street. 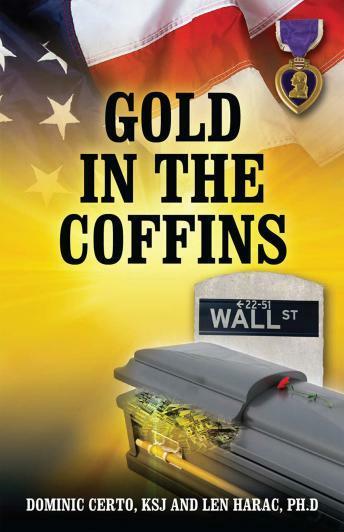 Gold in the Coffins follows the story of a tight band of retired Marines who bonded during a bloody tour of duty in Vietnam, only to find themselves facing a darker enemy back home, the demons of Wall Street. Donnie DeAngelo survived Vietnam and the rough streets of his childhood by never giving up the fight, whether his enemy was the Viet Cong or the mob. Defying all odds, he launched a successful coffee and food business, and decided to take his company public, but a Wall Street power broker has other plans for his business: force him and his comrades into bankruptcy and loot the spoils. When Donnie threatens to blow the whistle, his best friend winds up dead-and it looks like Wall Street has drawn first blood. Donnie and members of his former platoon are betrayed by the system they once fought to defend, leading them to conclude that revenge is a dish best served bloody. USA Today bestselling author Cara Lockwood called Gold in the Coffins "a satisfying thrill-ride" and said, "This is a book that unfolds like it was meant to be an action movie." Beth Sarafraz, NY Blue NOW magazine's managing editor said, "I was up all night racing to the very last page, and then I had to remind myself this was a work of fiction, but so thoroughly crafted...that I was sure this story...happened to someone out there, for real."